All the green coffee we purchase and roast is 100 % certified organic arabica coffee that has been hand-picked for superior quality. We take great care in roasting and cupping each single-origin coffee individually prior to blending, allowing us to bring out the best each varietal has to offer with deeper flavor in the cup. 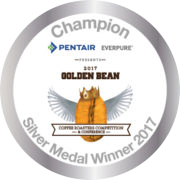 Lariat Coffee is a Golden Bean Silver Medal Winner for 2017. Taste a cup for yourself and see why we were chosen. Coffee so rich and flavorful you take pause to think about what you just experienced. Our coffee is as big, bold and rich as the land in which it is roasted. Lariat Coffee sits in the shadow of the North Cascade Mountain Range in the Old West town of Winthrop, Washington. Winthrop is the kind of place that fosters big dreams, bold moves and a can-do spirit. This spirit permeates all we do here at Lariat Coffee.